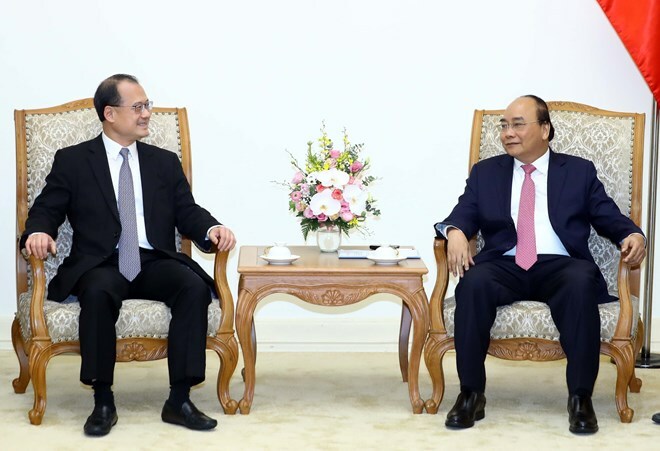 Hanoi (VNA) – Prime Minister Nguyen Xuan Phuc hosted Jonathan Choi, Chairman of the Hong Kong-Viet Nam Chamber of Commerce, and President of Sunwah Group, in Hanoi on March 19. He underlined the sound cooperation between Vietnam and China and particularly Hong Kong in various fields such as economy, trade, investment, tourism and culture. Jonathan Choi expressed his pleasure at the fact that many Hong Kong firms do successful business in Vietnam, including Sunwah, thanks to the facilitation of the Prime Minister, the Vietnamese Government and relevant agencies. Many Chinese enterprises are eyeing investment in Vietnam in the fields of start-up, tourism, energy and infrastructure, he added. PM Phuc said he supports activities to increase culture and education cooperation between Vietnam and China, contributing to promoting people-to-people exchanges. He hailed the chamber for organising many activities to connect Chinese and Japanese businesses to jointly invest in Vietnam as well as encourage Chinese firms to help Vietnamese farm produce reach out to the global market. The leader suggested the chamber host more similar activities to step up cooperation between Vietnamese and Chinese companies, not only for coffee and rice but also seafood and other products. The PM welcomed Chinese firms to invest in transport infrastructure and energy in Vietnam, affirming that the Government will create all possible conditions for foreign investors to do business in Vietnam without causing environmental pollution.